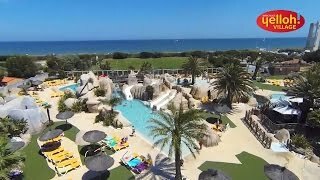 Situated across the yacht harbour from the resort of Canet-Plage, le Brasilia is an impressive, well managed family site directly beside the beach. The state-of-the-art reception incorporates an information centre. Although large, it is pretty, neat and well kept with an amazingly wide range of facilities – indeed, it is camping at its best. The touring pitches are neatly hedged, all with electricity (6-10A) and 304 with water and drainage. They vary in size from 80 to 120 sq.m. and some of the longer pitches are suitable for two families together. There is a variety of shade from pines and flowering shrubs, with less on pitches near the beach. A member of Yelloh! Village and Leading Campings group. There are 288 pitches with mobile homes and chalets to rent (the new ones have their own gardens). The sandy beach here is busy, with a beach club and a naturist section to the west of the site. 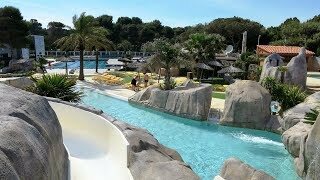 An exciting pool complex with pools catering for all ages and hydrotherapy facilities for adults is overlooked by its own snack bar and restaurant. The village area of the site offers a good range of shops, a busy restaurant and bar, entertainment (including a nightclub) and clubs for children of all ages. In fact you do not need to stir from the site which is almost a resort in itself. A free tourist train runs to Canet-Plage in summer. Nine modern sanitary blocks are very well equipped and maintained, with British style WCs and washbasins in cabins. Good facilities for children and for disabled campers. Laundry room. Motorhome services. Range of shops. Gas supplies. Bars and restaurant. Renovated pool complex (heated). New wellness centre including jacuzzi, massage and beauty rooms. Play areas. Sports field. Tennis. Sporting activities. Library, games and video room. Hairdresser. Internet café and WiFi. Daily entertainment programme. Bicycle hire. Fishing. Post office. Weather forecasts. No charcoal barbecues. Free WiFi in bar. From A9 exit 41 (Perpignan Centre, Rivesaltes) follow signs for Le Barcarès and Canet on D83 for 10 km. then for Canet (D81). At first Canet roundabout, turn fully back on yourself (Ste Marie) and watch for Brasilia sign almost immediately on right.